Eminem surprised the world by dropping the album Kamikaze last night. It's an angry, angry album, and Eminem names names -- Joe Budden, Tyler The Creator, Lil Yachty, Lil Xan, Machine Gun Kelly, Charlamagne Tha God, Mike Pence and more. Shady never raps the word "Drake". But he's surely talking about Drizzy on the title track Kamikaze. 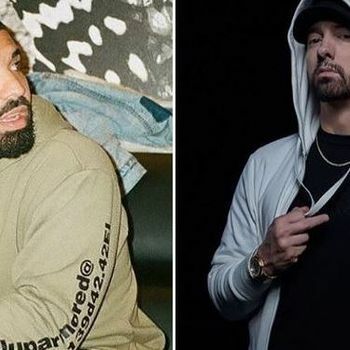 Line up the rappers, take my pic like a photo shoot"
In his bars, Eminem reminds Drake (who has an album called Views) that he still hasn't sold as much as him. He also alludes to Drake's ghostwriters and Blackberry. Does Drake respond? Or did he learn from Pusha T that he can lose rap beef and still win in the marketplace?